Bring more science to your every day learning! 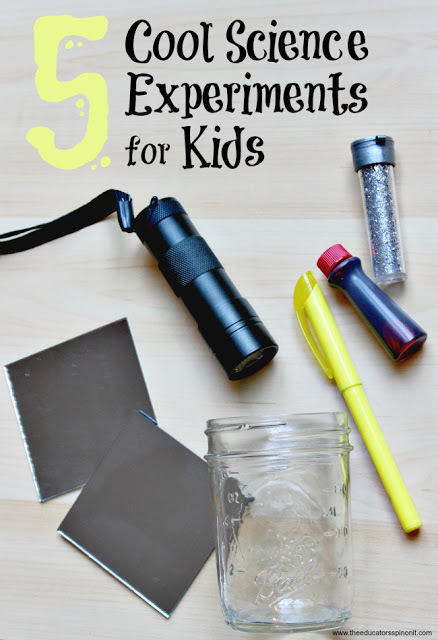 Here are 5 fun and easy science experiments for kids to make. We have the kids watch the videos, gather the supplies, set up their science experiment station, do the experiment and then clean up! Great for children in grade school and up. A special thanks to YouTube Kids for sending us a Hoopla Kidz Lab kids care package. We try to have at least one day every week were we do science experiments after school. It is something the kids and I really look forward to. Affiliate links are used in this article. Note for teachers: all videos do contain adds. You can start the videos prior to your lesson and pause to eliminate commercials in your classroom. The students will learn about light refraction: The direction of light rays changes direction. The students will make a vortex. The vortex forms because of the circular formation of the water. The students will make and explore a non-Newtonian liquid, meaning it behaves like both a liquid and a solid.